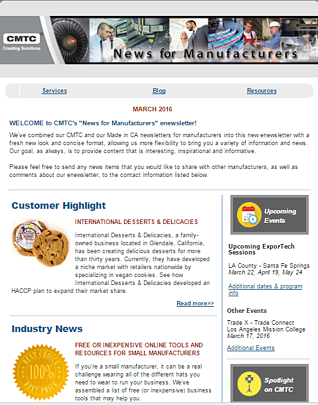 Sign up for our monthly newsletter to stay current on the manufacturing news important to you! The manufacturing industry never sleeps, because if it did it's quite possible that the world as we know it would come to a complete standstill. So, to keep you up to speed on all things buzzing in the world of California Manufacturing, while bearing in mind your time is precious, we developed "News for Manufacturers". The hand-curated monthly newsletter that's delivered straight to your inbox to keep you in the know without taking too much of your time. Your Industry News, Tips and Events. Sign Up Today!